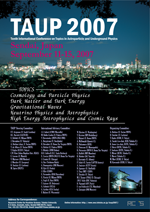 The tenth international conference on Topics in Astroparticle and Underground Physics, TAUP 2007, will be held at Sendai Civic Auditorium in Sendai, Japan on September 11-15, 2007. This conference is the tenth in the TAUP biennial series, started in 1989 at the Laboratori Nazionali del Gran Sasso. The purpose of TAUP is to bring together theorists and experimentalists working in Astroparticle Physics, to review and discuss the status and prospects of the field. 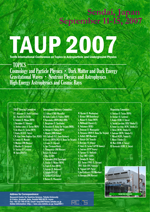 TAUP 2007 will consist of invited review talks, workshop sessions devoted to specific subjects and poster sessions. This Conference is sponsored by IUPAP/PaNAGIC. Attendance will be by invitation only. Those wishing to receive further information may contact TAUP 2007 Secretariat (taup2007@awa.tohoku.ac.jp). The invited persons are kindly requested to register at their earliest convenience. The conference fee is 40000 Japanese Yen (JPY).